For the first week after their mother leaves, the March girls are exceedingly virtuous and industrious. After that, however, they become more lax in their efforts. Jo catches a cold and thereby gets a holiday from Aunt March, Amy drops her housework in order to play with clay, and Meg forgets her sewing in lieu of writing letters to Marmee. Beth, however, continues to be industrious (although she does grieve). Mrs. March provides a moral compass for her daughters. With Mrs. March gone, the girls—all except Beth—quickly go astray from the path of virtue. Beth’s industriousness and piousness can be seen as ideal feminine traits; in many ways, she encapsulates the ideals 19th century femininity (she is pious, chaste, hard working, physically weak, etc.). Beth goes to Meg and asks her to see the Hummels, as their baby is sick. Meg feigns fatigue and continues sewing. Beth then asks Jo if she’ll go, but Jo uses her cold as an excuse not to go (even though she’d been well enough to see Laurie earlier). Beth implores them to go – she would do it herself, but her head aches and she feels tired. Jo and Meg suggest that Beth send Amy to do it. Amy is away, and Beth waits an hour for her with no luck. Beth decides to take it upon herself to go to the Hummels. Mirroring the lesson of Chapter 11, the girls once again find themselves cultivating sinful thoughts and actions once they give in to idleness. The stakes, however, are much higher this time. It’s implied that something bad is going to happen as a result of the March girls’ slothful ways. Beth arrives quite late, and no one notices her hide away in her mother’s room after she comes home. When Jo finds her, it’s apparent that Beth is ill. Beth informs Jo that the Hummels’ baby has died of scarlet fever, and Beth fears that she’s caught it. Jo chastises herself for letting Beth go to the Hummels’ every day that week. Hannah is alerted to Beth’s illness, Jo resolves to be Beth’s primary nurse, and Amy (after some coaxing from Laurie, who promises to visit her every day) is made to stay with Aunt March in order to avoid getting sick. Beth has always been sickly, but now that she has scarlet fever she truly fulfills the stereotypical 19th century role of the pious invalid (that is, a meek, pale, large-eyed creature whose purity and goodness have slated her for an early death, given that she’s too good for this world). The March girls are thrust into a series of moral tests thanks to Beth’s illness. Laurie and Meg wonder if Mrs. March should be told of Beth’s illness. Hannah (who has experience with scarlet fever) has told the children that she thinks Beth won’t be too sick, and that it would be more harm than good to tell Mrs. March about Beth’s sickness. They decide to wait and ask Mr. Laurence for his opinion. Jo and Laurie take a reluctant Amy to Aunt March’s house. Once again, Mr. Laurence is established as the surrogate patriarch of the March household; even though Hannah has just as much life experience (if not more), she defers to Mr. Laurence’s judgment given his maleness, social stature, and wealth. Reges, Margaret. 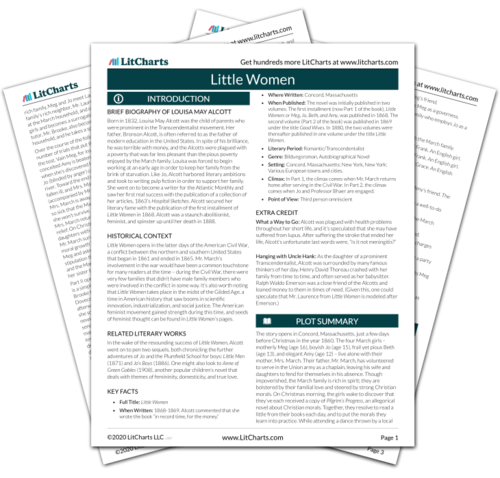 "Little Women Part 1, Chapter 17: Little Faithful." LitCharts. LitCharts LLC, 24 Nov 2014. Web. 23 Apr 2019. Reges, Margaret. 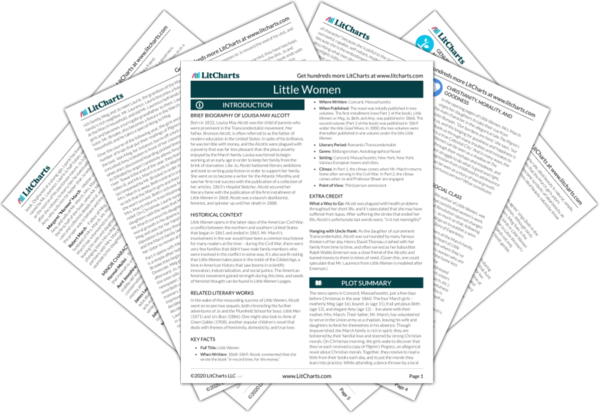 "Little Women Part 1, Chapter 17: Little Faithful." LitCharts LLC, November 24, 2014. Retrieved April 23, 2019. https://www.litcharts.com/lit/little-women/part-1-chapter-17-little-faithful.